I did very little knitting this year for Christmas. I've done very little knitting the past 3 months. The socks featured in the blog entry a few entries down are in time out, off the needles and waiting to be rewound. Somehow the gauge (even though I did the math) just wasn't right, so I'm starting over with new yarn, and a smaller stitch count. I finished the Glittens, but forgot to take a picture of them before giving them to my friend. Thankfully I finished the below Christmas present before my 'not in a knitting' mood struck. The person it is for doesn't read this blog, or at least has never mentioned that she does, so I don't think she'll see it before hand. 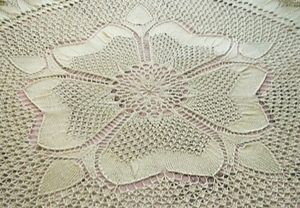 It's the Rose of England Shawl. 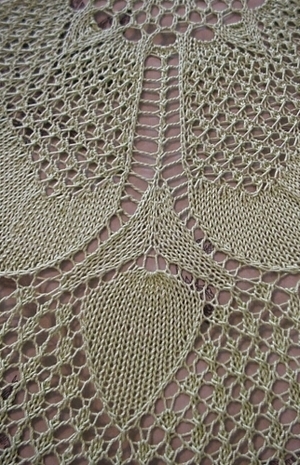 Yarn: Size 3 cotton crochet yarn on size 3 needles. I went back and forth about giving this to my chosen person, because I am really afraid it is not quite what she had in mind. 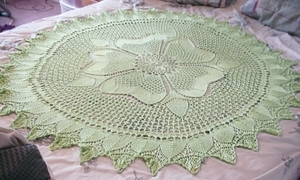 It's for a table top not to be worn, thus I used heavier yarn, but I think it might be to heavy. I also, as I always do, ran out of yarn, so fudged the edging. I finally set about blocking it a bit today. Mostly with a steam iron and hoping to get the points a bit out so that it might lay or hang somewhat straight. 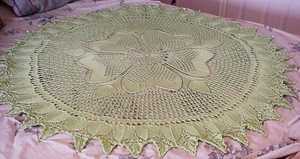 It's a pretty shawl, just not so much in love with it. But it's a design I think my chosen receiver might like (roses being one of her favorite flowers) and in a color that she likes (yellows and greens are her favorite) Plus it's a supplement gift. My husband bought the 'real' gift months ago. I hate talking bad about my knitting, but I don't know. It's probably a good thing that this was about the only Christmas knitting I did this year. We've decorated! 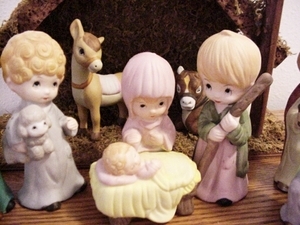 Now for most people this wouldn't be an odd thing to do, since it is the season to decorate, but there have been years in the past we didn't. Or if we had, it was very simple. And got a Tree! 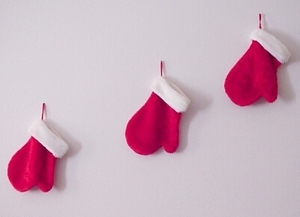 And Candy Canes to hang on it. The Star is from my childhood tree. Thanks to some special Christmas Angels from our children's school our tree has many of presents under it this year. 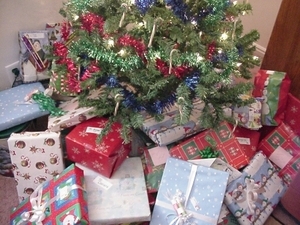 (although some of those presents are for family in Idaho too) We are blessed. Christmas count? Hmm Kids 10 each? Jon 1, and me none. Boohoo. I will cry. 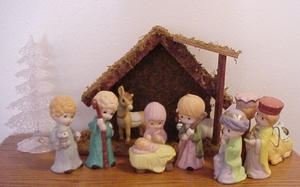 Here's the corner Deonna decorated. 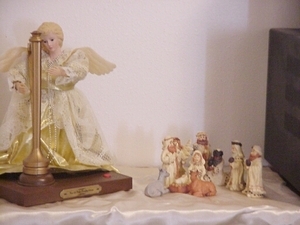 It's the attack of the Giant Angel on the poor Holy Family and Friends. I think it's so cute. Look at the little Lamb. There! See. We did decorate! I've been knitting more. I started a shawl, using Shadow from Knitpicks. It's in the Oregon Coast Colorway. I thought I'd like this colorway but it's not really singing to me yet. I didn't take any pictures of it. But there are 2 other projects I have underway. 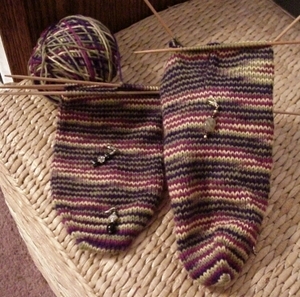 I continued on my way trying to find a toe up sock pattern I thought I would like. And I think I might have found it. My last attempt at toe up socks involved short rows, and it didn't really go so well. 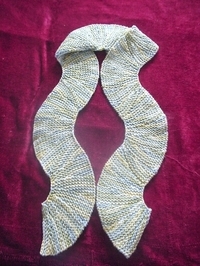 This pattern (here) doesn't use short rows, and it has what looks like a heel flap. I've had to changed the pattern a bit (mostly with the heel extension) so when I pick up stitches I didn't get holes, but I think it just might work. Also I was happy to notice (after fudging around with math for a day) that at the very top of the page she includes another page for other size socks! Yippee. I'm knitting these on size 2 needles over 56 stitches using a discontinued Knitpick (super soft) sock yarn in a very weird colorway. I'm sure when I bought this yarn it had to have looked better on the computer screen. Greens and purples, and yellows? What was I thinking. 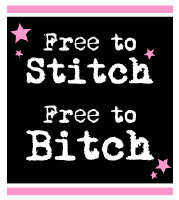 But it's been nice yarn that's been behaving for me. 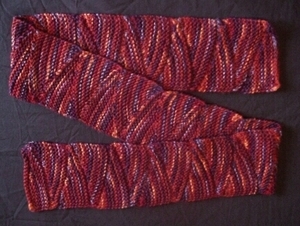 It started pooling a bit more than I liked during the gusset increases but it's livable for now. Otherwise it's been stripping in a sort of spiral way quite nicely. My second project involves a request I received from a wonderful gal at church. She's living with ALS and asked me if I could knit her a mitten that has the thumb and first finger free. I had no idea such a pattern out there even existed, but when I sent out a pattern call I got boat load of pages back. 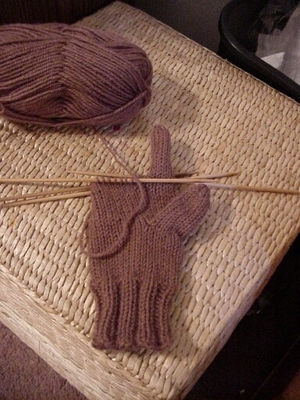 So, I'm stretching myself a bit and knitting my first Mitten and Glove. 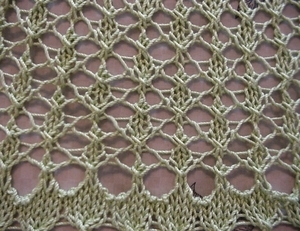 I'm using this pattern (Here) but modified it to fit my hand. This is more a test knit to see what I might need to change to fit hers. I even surprise myself at how well I'm doing at it. 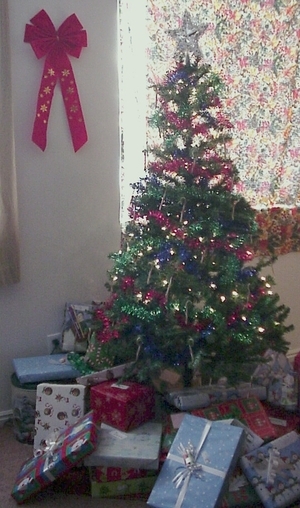 We decorated for Christmas this year, with a Tree. (don't faint those of you out there) I'll take pictures and post them soon! I know it's been a long time since I've posted. Life's been interesting past few months and I think now I can show you why. 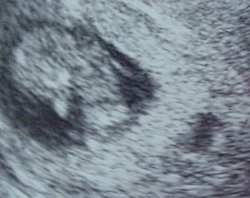 I've been reserved in posting about the baby because of past issues with a miscarriage. Some of you know how that goes. I've had some big iffy moments with this pregnancy, but the doctor showed me what might be causing my stress. I've labeled it in this picture. It's a pocket of blood behind the placenta. We call him Peanut. The kids are very excited. Especially Mike. I know, don't worry, I'm working on growing that extra arm and leg this week... Been busy you know! Maybe even work on his neck. He's only an inch long. Yes 'Him' I can't help it but we are being a bit bias and hoping for a boy. Brown Haired boy. I'll be having contests later in the pregnancy about whether it will be a boy or girl and what colored hair it will have. I couldn't wait any longer to tell everyone. The appointment on Monday showed a growing (although smaller then it should be) baby, with a heartbeat so I figure I'm pretty far along that I can stop worrying about every little thing and let the world know. Prayers are always welcomed. No, not really, not much at all. Mornings have been hard, and that was when I got most of my knitting done in the past. I'm trying to start a new shawl, having forgiven myself of all the Christmas knitting. It's not going to happen. Sorry. Maybe next year. So have started a new triangle shawl, for me. I'm so selfish.